Free classical guitar lessons, tutorials, and practice advice. I’ve also created a small curriculum to help guide students through the early learning process. Many of the lessons are from professional guitarists while some of the more specific lessons are by your host here on the site, Bradford Werner. Bradford teaches classical guitar privately and at the Victoria Conservatory of Music, in Victoria, BC, Canada. I also offer Video Response & Skype Lessons. Classical Guitar Method Book Vol. 1 by Werner – Free 100 page PDF method with 20+ video lessons for beginners. Focus is on reading music and playing melodies and arpeggios. Classical Guitar Method Book Vol. 2 by Werner – Solos, duets, chords songs, 15+ video lessons. The main focus is on reading in different keys but also introducing slurs, half barres, rhythm, and some upper positions. 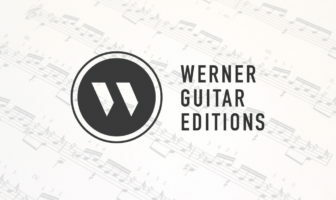 Classical Guitar Technique by Werner – Essential exercises, scales, and arpeggios. Study this as you continue with all the below material. Ten Classical Etudes – Ten progressive etudes from the classical era with video lessons. Grade 4-7. Should Beginners Use Rest or Free Stroke? Guitarists Should Practice Triadic Arpeggios more often! Video lessons for my ebooks are listed below the product description and buying info and are free to watch. The grades here are loosely based on the RCM Toronto. The grades are preparatory to grade 10 and then the ARCT. Keep in mind that there is no such thing as grades in music, pros play from a variety of levels. Many pieces could go in different grades depending on the quality and speed you want to play it at. However, the intention is to help students find repertoire appropriate to their level. ‘Book’ refers to hardcopy links. The Bible of Classical Guitar Technique by Hubert Käppel. This book is like Pumping Nylon on steroids. 245 pages of exercises and excellent text advice, photos, explanations, and tons of exercises. This is a huge contribution to the guitar world and I’m only just starting to dive deep into the ideas. Also great practice tips and general musical advice. Highly recommended. Kitharologus: The Path to Virtuosity by Ricardo Iznaola – Progressive: from beginner to extreme advanced. Very good technique book and the progressive sections are a great idea to help organize students. Covers technique exercises and also a significant amount of fingerboard knowledge. Beware however, although the book starts out super easy (open strings) but it gets very difficult fast. This is not a criticism but you should know that you will not just zoom through the book. Iznaola on Practicing: A Manual for Students – A great but little book on how to practice well. Many students of guitar are not going to read a huge book so this concise little booklet is perfect for getting a grounding in good practice habits and philosophy. Sight Reading for the Classical Guitar, Level I-III by Robert Benedict – Form, phrasing, dynamics, texture and how to sight read. Excellent book for a solid education in music. Beginner but also a good review for intermediates. Sight Reading for the Classical Guitar, Level IV-V – Continuation of the above book. Scale Pattern Studies for Guitar by Aaron Shearer– Sight reading skills and scales..no BS! Nearly 300 pages of scales and sight reading. Learn the scale then learn how to read music using the scale. This connection between reading and scales is very important. Highly recommended. Shearer Supplement 1: Slur, Ornament, and Reach Development Exercises – Thorough set of exercises and a great workout. The books are well thought out as to not be ignored. A Tutor for the Renaissance Lute (Poulton) – Fantastic! Learn how to read Renaissance lute tablature and the techniques and performance practices that go along with it. Keep in mind that this is an actual lute book so you have to transfer the knowledge to guitar (maybe for more advanced players). The Techniques of Guitar Playing by Seth F. Josel & Ming Tsao – A fantastic book on modern and historical guitar techniques geared towards composers. For advanced students interested in contemporary music. Read my Full Review.